Product prices and availability are accurate as of 2019-04-19 01:58:03 EDT and are subject to change. Any price and availability information displayed on http://www.amazon.com/ at the time of purchase will apply to the purchase of this product. The Fire Sense 29-in. Folding Fire Pit with FREE Cover is a great fire pit for tailgating or to bring along on camping trips. Its lightweight design make this painted steel bowl easy to carry from place to place and won't have to trouble yourself with tools and time-consuming assembly - just flip the legs down and you're ready to go! Whether you're looking to warm yourselves and tell ghost stories or grill brats and melt s'mores is totally up to you. 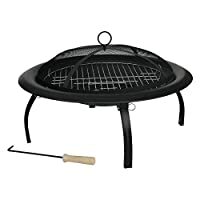 This 29-inch fire pit comes not only with a mesh screen, and fire tool, but it comes with log and cooking grates as well so your fire pit has a variety of applications. Measures 29 diam. x 17.3H inches and includes handy PVC carrying bag to protect the pit from the elements and make toting easy. 29-in. fire pit with PVC cover. Steel fire bowl with folding legs. Heat-resistant mesh spark screen. Includes grate, fire tool, and carrying bag. Dimensions: 29 diam. x 17.3H in..
29-in. fire pit with PVC cover Steel fire bowl with folding legs Heat-resistant mesh spark screen Includes grate, fire tool, and carrying bag Dimensions: 29 diam. x 17.3H in.